Falafel is very similar to masal vadai that we make in south India. The key ingredient in it is garbanzo beans while vadai is made with Channa dhal. So technically it cannot be that hard to make falafel having made vadai's a zillion times, right? Well, that is what I thought last Friday while I was preparing my nephew's birthday dinner on the Mediterranean theme. I had no clue as to what went wrong with my falfafel making process. As per the recipe, I deep fried the dough which disintegrated and left me with sediments in the frying pan. Disappointed with that outcome I went to plan B and used the appam pan thinking that it would work. That back fired big time. It was super sticky in my nonstick appam pan and started to partially disintegrate. Furthermore, I could not get it out in a decent shape. Looking at the big bowl of falafal mix ,I was left with no other option but to make patties with it and bake. I was comfortable with the baked falafel because I have made them before and it was good and healthy. Just then, I called my sister and my brother-in-law picked up the phone. I mentioned to him that I was baking falafel. He told me that it would not have the same taste or crunch as the fried ones and suggested that I fry the baked ones. So I was back to square one, taking his advice I deep fried the baked falafel. The result, some tasty, crunchy, nicely cooked and perfect looking falafels. One thing I learnt out of all this mishaps is that, if you bake and fry it takes very little oil. Garbanzo beans - 2 cups pressure cooked. Feta Cheese - 1/2 cup crumbled. 1. Add all the above ingredients in a food processor and blend with adding water into a coarse mix. 2. Make flat patties(like tikkies) and place them on a oiled cookie sheet. Set the oven to 375 degrees F and bake them on each side for 15 minutes. Before assembling the sandwich make the salad by add the sliced veggies to a bowl. Sprinkle some extra virgin olive oil and adding some pepper. Crumbling some feat cheese and giving it a toss. 1. Take a pita bread and warm it for 20 seconds in the microwave. Place it on a plate. Spread 1 tbsp of hummus over the full pita. 2.Spread 1 tbsp of the yogurt sauce on top f the hummus. 6. Add the salad on one side of the pita and top it with 3 falafel. 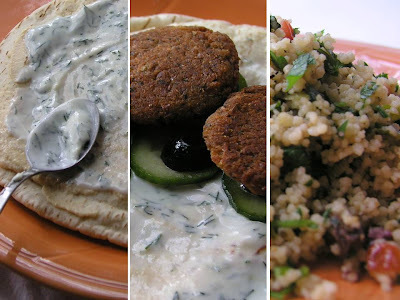 Fold the pita and serve it with some couscous salad on the side. I usually bake it..Now I shall bake and then fry it!!! Love it! Baking and frying makes me drool..
Karadaiyan nombu adai also looks good, with a bit of butter, it is heaven..
Looks good enough to eat. I am happy it turned out good after some crazy moments. I hope your nephew enjoyed this wonderful meal. Thanks for stopping by Sri. Falafel looks healthy and delicious !! I have only made this deep fried. Yours have come out nicely browned. wwoww.. the falafel looks crunchy... but I am surprised it stuck to the non-stick pan... do you know why that happened? Thank you all for the nice comments. I think baking along with some rava/cream of wheat makes all the difference.I wish I get to eat some from Egypt some day and I will think of you. This sandwich was awesome! Thanks. Indhu, I have idea myself. I guess the pan is getting old. We love falafel! looks beautiful. falafel pita bread looks delicious,, i like it very much tried many times in restaurant,,,now i got the recipe to try on my own,,,thanks for sharing dear,,,take care n keep smiling..
Love falafel sandwich...its our one day in a week menu...lovely presentation.. They not only look good but they taste fantastic. It is like a vada instead of the usual round shape and so are crunchy. I liked it a lot.